In a recent article for Polygon, Ben Kuchera described David O’Reilly’s Mountain as “a one dollar video game that seems to be laughing at people who strain to find meaning in abstract indie titles.” This is a problem. 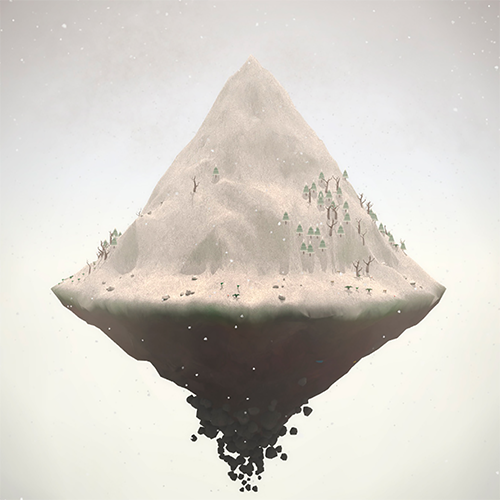 To clarify: Mountain depicts a 3D rendering of an uprooted mountain, floating in space. It rotates, steadily and stoically, as weather forms and disperses around it, as the sun rises and sets, as enormous objects crash into its face. Sometimes text appears at the top of the screen which express some abstract musing: “I LOVE THIS PEACEFUL SUMMER NIGHT” or “I EAT THE THINGS AND MAKE NEW THINGS.” If you want, you can move the camera around the mountain, or you can make small synthetic chimes, though you’re never told to and these actions don’t seem to affect very much. Mountain is an extremely simple work. Trying to put motivation to the release of the game is folly, you never really know why someone did something and what they’re trying to achieve, but I can’t shake the feeling the creator of Mountain, David OReilly, is reading some of these articles and laughing his head off. The idea here is that Mountain is a ploy. Kuchera is suggesting that David O’Reilly made something deliberately veiled and obscure because (at best) he thought it would make him look very clever and auteur-ish, or (at worst) he is playing a dark, manipulative trick on his audience. Either way, the implication is the same: because he hasn't been explicit in his artistic motives, O’Reilly is up to something. This basic distrust of the opaque pervades game culture [see footnote 1]. In broad pop-cultural terms, games are expected ideally to be fun/digestible/gratifying, but if that’s not possible then they should at least be meaningful (i.e. if I can’t play it like a game, I should at least be able to read it like a book). The problem with this attitude is that it doesn't leave game critics particularly well-equipped to engage with works that don’t hold up to analytical scrutiny. This isn’t to say that Mountain should not be regarded analytically — this just probably isn’t the best way to read it. Just to be clear: Mountain is not a text. It shouldn’t be treated as one. Mountain is best understood as an exercise in form — it’s a small, contained work that depicts and explores a mountain as an object. It’s not aspiring to anything greater. It’s iconography. This is fine. Popular videogame discourse has a very hard time accounting for formalism. Formal qualities are rarely considered as the core of a game. Even in the most formally expressive games, these qualities exist to be interacted with, rather than observed and appreciated in their own right (see Rez, Ico, Journey etc.). Despite being a bit of a caricature at this point, the vocabulary of games criticism has, historically, only been able to discuss formal aspects in strictly teleological terms — formalism in games is an arms race, with some abstract idea of spectacle/realism/fidelity as its endpoint. Even beyond the AAA production space, the rhetoric surrounding indie games is deeply concerned with visual “uniqueness” or innovation, the subtext being that the formal achievements of one game is only appraised in direct competition with all other games (again: this teleological thinking is problematic). Mountain has no interest in competing on these terms. There’s no attempt to offer the player varied systems to engage with the mountain beyond looking at it — one of Mountain’s greatest strengths is how content it is as a small, purely formal experience [see footnote 2]. I can’t get over the fact that the whole thing feels like a put on, as if the whole thing is the act of a modern artist who placed a piece of ice on the floor of a gallery and charged admission to come watch it melt. Could we find meaning in the act of standing around, knowing that we paid money to watch ice melt? Sure. Does that give the work value, meaning or justify the cost? Alÿs is well-regarded for his works’ intersections with urban and social politics, but a work like Paradox of Praxis 1 has a serious formal value that supersedes these contexts. Regardless of authorial intent, regardless of speculated metaphor, the act itself of pushing a block of ice is worth attention (and probably a dollar, at the very least). The performative act of endurance, the slow decay, the futile absurdity — these are inherent to the work’s form, not its text. It’s not a matter of uncovering meaning. Alÿs is not secretly laughing at his audience. There is value in watching ice melt. Mountain is not making a joke at Ben Kuchera’s expense. So, the problem: in the vernacular of games criticism, it’s difficult to discuss games in terms that aren’t either technical or analytical, which leaves purely formal works like Mountain regarded with suspicion and derision. This probably won’t be a problem for too much longer, as the scope of critical acceptance is constantly widening (consider that the distrust of Mountain is descended from the distrust of Proteus, which is descended from the distrust of Dear Esther, and so on) — even if it’s slow progress, we’re getting somewhere. The solution, then, is through more works like Mountain: self-assured exercises in tone and constraint, that don’t overreach conceptually or aspire to make complex statements. The solution is through a formalist approach to videogames. This is obviously a broadly reductive sentiment (and I hate to buy into the tangled rhetoric of anti-anti-intellectualism) although it at least holds true through the impressions given in Kuchera’s article’s comments, e.g. “A game solely designed for game writers who are up their own arse and yearn for meaning where there is none. Kudos to Kuchera for seeing through the lie.” Again: this is a problem. That said, this self-contentedness is undercut by its use of text — the abstruse captions, apparently meant to anthropomorphise the mountain, don’t do much to dissuade analytical readings. The end result is that Mountain feels like an interesting formal exercise while being a bit of a conceptual mess — anyone familiar with O’Reilly’s digital animation work knows that Mountain isn’t much of an outlier in this regard.